Together, The Great Trek part one and two covers a timeline from 1939-1945, and some years following, with each event in order. These historical moments involve extreme hardship including famine, difficult travels, war and exile. This is briefly introduced, summarized and concluded by historian, Gerhard Ens. The film is produced and directed by Otto Klassen, who has produced several other films about Mennonite history. Many of his films such as these contain rare footage from European archives. Much of the information that Otto Klassen covers in his films comes from first-hand experience including witnessing Soviet propaganda, war, and famine in the 1930’s. 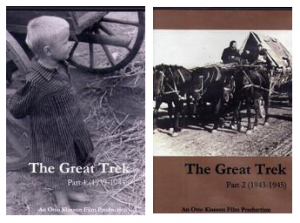 Both parts of The Great Trek are produced in black and white, comprised of archival footage from the German Bundesarchiv, and other archives such as the Mennonite Heritage Center in Winnipeg. The narration is voiced by Victor Sawatzky. These films unearth the brutalities endured by ethnic Germans, (many being Mennonites) throughout WWI and WWII. Maps are shown to distinguish areas of significant happenings, while archival video footage fills any momentary pauses in narration. Through voice and visuals, Klassen creates a highly educational film which does not take lightly the harsh realities of the past. These stories may be upsetting, especially for viewers who have family ties to those of first-hand experience. There is also some visual content that may call for careful consideration when choosing to watch with younger viewers, such as deaths (bodies shown in a few images), as well as a brief scene where a man is killed and bloodied. Other examples include various war scenes, shots fired, bomb explosions, and other attacks; however, the viewer does not see any graphic detail of these. Part one’s run time is 35 minutes, looking at Germany’s attack on Poland, the Red army and the Polish campaign. The reasoning for the Mennonites’ migration from Danzig to Southern Russia is explored, with exemption from military service being one of the contributing factors. Following topics include settlement camps, Stalin’s mobilization procedures, torture chambers, the secret police, victims and imprisonment. Deaths and causes, work, and survival are largely discussed as well. Time is taken to explain the agriculture of the Mennonites and their struggles in regard to this type of work during these events. Brief history is given on Alfred Rosenberg who was in the National Socialist party, and how this party changed the ways that Germans were viewed. Another significant figure is addressed, however on a positive note- Johann Epp, a Regional Administrator, who did his best to improve conditions for Ukrainian workers in 1942. Part two’s run time is 39 minutes and explains the trek back to the West by 350,000 Soviet Germans (many being Mennonites), as numerous people were repatriated. This also looks at the Mennonites as they fled from the red army in early 1945. Details throughout this second part elaborate on the experiences of German soldiers (some being Mennonites) building emergency bridges on the Dneiper river. Viewers are also informed of Hitler’s re-issuing of Stalin’s scorched earth policy, dynamite demolitions in 1943, and other intense moments of the journey(s)- answering questions of who, what, and where. The film discusses homeless refugees, those who were able to settle in new homes, and those who were exiled to Siberia. In conclusion, Ens explains where many of the Mennonites lived post-1945. “The Great Trek Part 1”. CommonWord Bookstore and Resource Center. CommonWord 2018. “The Great Trek Part – 1 (1939-1943)”. An Otto Klassen Film Production. 2007. “The Great Trek Part 2 –(1943-1945)”. An Otto Klassen Film Production. 2007. “Text to Terabytes”. Stoesz, Conrad. Mennonite Historian. A Publication of the Mennonite Heritage Center and the Centre for MB Studies in Canada. Vol xxxv, No. 2. June 2009. Web. July 2018.